a schedule that depicts the amount of MONEY supplied and the INTEREST RATE. In some analyses, the MONEY SUPPLY is drawn as a vertical straight line; that is, the money supply is exogenously determined, being put into the economic system ‘from outside’ by the government (for example, government-issued notes and coins which form part of‘narrow’ M0 money). However, a significant part of the ‘wider’ money supply (M3 money) is endogenously determined - for example, bank deposits are ‘created’ by the banking system and these are highly interest rate-sensitive. Thus, as a general proposition, the higher the rate of interest (the higher the return on loanable funds), the greater the quantity of money supplied (see Fig. 128 ). 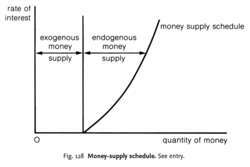 The money-supply schedule interacts with the MONEY DEMAND SCHEDULE to determine the equilibrium rate of interest. See MONEY SUPPLY/SPENDING LINKAGES, BANK DEPOSIT CREATION.